I’m an expert at stuffing my emotions. It’s not something I’m proud of, but I’ve done it for so long that it comes naturally. Going to counseling would mean sitting and talking with someone who is professionally trained to bring up those exact emotions I’ve been hiding…and I would be paying money for that experience. I love listening to and encouraging others, but talking about myself is much harder. I thought needing help from others was a sign of weakness. Looking back, this seems ridiculous, but it was a lie that I heard over and over again in my head. So, what made me finally take the risk and see a counselor? The desire to follow God’s calling on my life became greater than my fears. This isn’t something that happened overnight, but over several years. Deep down, I knew that the things I didn’t want to talk about were the exact things I needed to talk about. I knew that God wanted to use all of my story to reveal His glory…not just part of it. But first, I needed to get some help. I spent several months in counseling, and while it was one of the hardest things I’ve done, it was also one of the best things I’ve done. My emotions were validated, I received Godly wisdom/advice, and I gained a sense of empowerment. I learned that sometimes the hurts in our life are too big to handle on our own, and that’s ok. That is why God has placed others around us. It’s hard for them to support us, though, unless they know there is a need. If you’ve had a positive experience seeing a counselor, I would encourage you to share that with someone. The more people talk about reaching out for help, the more likely others will too. With one confession at a time, the lie will be replaced by the truth: Reaching out for help isn’t a sign of weakness – it’s one of the bravest things you can do. 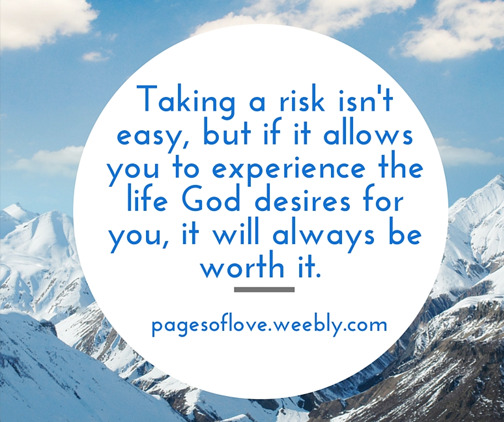 Taking a risk isn’t easy, but if it allows you to experience the life God desires for you, it will always be worth it.